So, there I was, rammed up against a wild rose, with a thorn in my hand and a thorn in my coat and a thorn in my scarf and unable to break free - when a woman came by with a dog. "Have you found something interesting?" "I've found I'm stuck to this bush," I said, speaking over my shoulder. I felt more explanation was needed. I mean, how did I come to get stuck to the bush? "I was photographing this branch." I nodded at the flailed branch on the catkin-ed tree, hoping to interest her in my monitoring project. Failed. I could see she was trying to see the point. I could see she was trying really hard. And I could see it wasn't working. She walked on. My hand was full of blood. My phone was red with the stuff. And both were horribly sticky. I wasn't even meant to be photographing that tree. I was meant to be photographing buddleia. I don't like buddleia. That's why I'd been putting it off. "It'll be in shade by now," I reckoned - and I headed down to a beach where I could walk unembarrassed by my bloody hand (which wouldn't stop dripping) and the red, sodden tissues with which I was trying to stem the flood. Another day . . . and back to Buddleia. Cultivated buddleia may be alright. (Though I'm not sure even about that. I used to think it was lilac gone scraggy.) 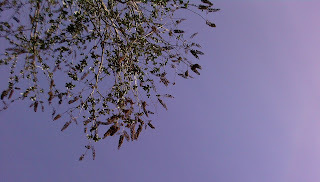 Wild buddleia, well, its leaves are dull and boring when grown and the flowers hang tatty too long. Buddleia doesn't seem to object to being flailed. Smashed down one minute - sprouting the next. One from the 5th December. The other from the 17th January. You can see the branch has been broken. You can see the bush hardly cares. Leaves were already sprouting robustly before the heavy frosts (which have knocked down the nettles and much of the ground elder). And after the frosts? Another burst of leaves! (You can see it in the bend of the branch. The hedge is embedded with bits of branch. The ground is strewn with them. Grasp a branch still attached to the tree and ask it to help you balance - it falls off in your hand. But the plant lives on. (Incidentally, although I don't like Buddleia, I do like its trunks and woody bits; wonderfully varied in colour (depending on the weather) and fibrous and shapeful . . . ). And here is another reason for not liking Buddleia. But, I tell you, I wouldn't like to live in one of the houses which rest on this wall! And I always feel a bit nervous when near it! It's very beautiful but it's a graveyard for trees too. Here, seen when the tide is out, are the gardens which fell off a cliff one night a few years ago. Householders woke one morning to find the ends of their gardens missing - lawns and greenhouses and horse chestnuts had been sheered off and were down on the beach below. To the north of here, there is a huge coastal defence which protects a road. To the south, the mouth of The Fleet (a tidal lagoon) was relocated when a new bridge was built to link Weymouth with the Portland causeway. When the sea wants to eat the land, it seems it can't be stopped. It has to bite at something. If you protect one bit of the shoreline, you are likely to put another at risk. Tidal dymanics are difficult to understand and knock-on effects hard to predict. None the less, it's a political issue. Should this stretch of coast and the land alongside it be protected at the expense of others? 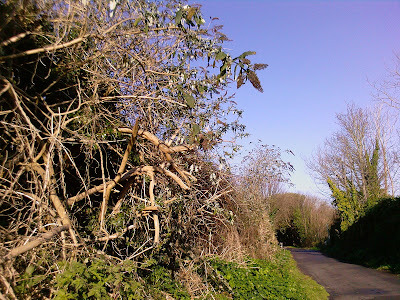 Poor old Council - responsible both for commissioning the flailing of trees and hedges on the land - and for deciding whether or not to let trees and houses and gardens fall off the edge of it! I started to laugh when you were describing being stuck in the bush and the passerby clearly found this unusual and incomprehensible. The bit about the blood was less funny, or still funny but in a black way. As for the buddleia bit - I love buddleias. I love the way they have so many different coloured flowers, I love the way they attract butterflies and most of all I love the fact that they seem to be indestructible. 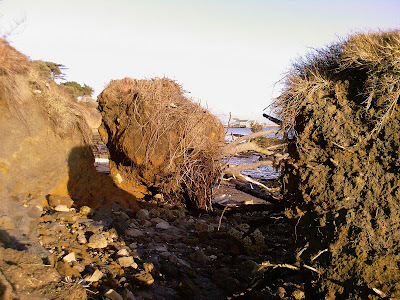 Re the coastal erosion - I guess we will be seeing lots more of that with global warming. The only thing we can be certain of is change! Defintitely, Catmint - keep laughing. Cut hands and muddy knees are part and parcel of doing this kind of blog! Buddleia - I think I will turn out to be in a minority here! I do find them fascinating when they get into this kind of mess though - but I don't suppose many people would want such a tangle in their garden. Erosion. Maybe there will be more because of global warming. However, its always been happening along our coasts. There are bits of land which didn't used to be there - and villages which are now under the sea. There are places in England, though, where councils have had to ban people from going into their homes because they are now too near the edges and where houses have lost their value - or even have none at all - because it is clear the sea is coming closer. This is quite a post!... packed with interesting facts and photos. I had read that Buddleia is invasive in warm areas. I found one growing in the brush pile, probably from a pruned switch not a seed; or, did I mention that already. I think it is too cold here to be invasive... yet. I do feel sorry for the people who are losing their property to the force of the sea. Maybe they should plant more Buddleia along the cliffs and verges it seems determined. When it comes to planting buddleia on the cliffs . . . well, I'm a bit out of my depth with that idea but my guess is that it would be destabilising. 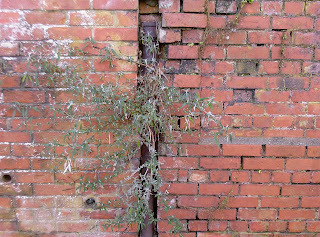 It's roots get in between the bricks in walls. I would expect it to do the same in the cracks in the clay / earth / rocks and make the cliffs crumble further. 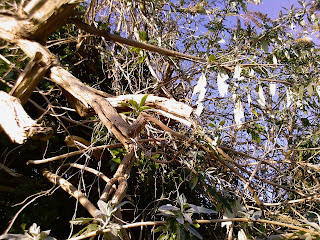 I don't think you'd mentioned the buddleia in your brush pile before but I have learned something from your comment. Also, although there is some buddleia growing on the cliffs nearby, on the whole, I think it prefers to be out of the wind. I can see how buddleia could be considered ratty and scraggly when found in the wild. Even in the garden setting it needs to be groomed in order to keep from sprawling everywhere. We have some planted at the edge of our property line to be an informal hedge and let it flail all over the place. It does the job, but 'informal' is definitely the operative word! Hi Lucy, I was jesting about the Buddleia holding back the land; I should have put "LOL" after that :) Yes, you are correct about Kentucky being hot in the summertime; you probably got that idea from reading my complaining. The extremes in temperature make it hard on the gardeners here. 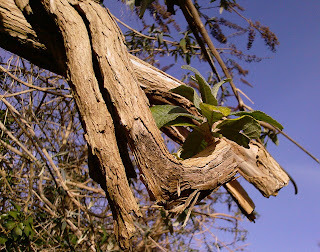 The winters often kill Buddleia to the ground, but it grows back from the roots. In states farther south, it goes wild. 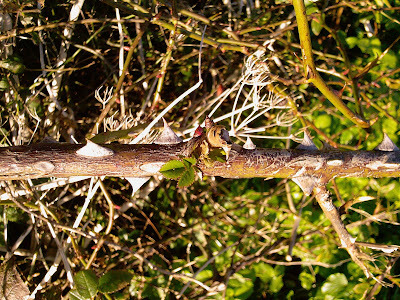 Those rose thorns are wicked looking! Probably good that your hand bled, to wash out the puncture wounds. Journalists sometimes do get wounded, and you were determined to get that shot. Good work! I don't want to be over-dramatic about these gardens. Fortunately, they are big (with big houses built in them!) and the landslip didn't come too near the actual buildings . . . but the threat is constantly there . . . what with bits falling off . . . Sorry about the long gap in posts over Christmas and the New Year. What with the festivals . . . and winter bugs . . . and school holidays . . . ! P.S. There's just a triangular mark now. Sorry, Barbie, to be so humourless. Initially, I took it as a light remark, then remembered you talking about grass and reeds being used to keep dunes etc. in place . . . then, as I pushed the publish button, I realised I wasn't sure. Oh dear. Apologies. Ouch! You have my sympathy! The thing about rose thorns is that they curve downwards, so if you try to pull away, you pull the thorn deeper into your flesh. I remember pruning a Rosa 'Mermaid' and being up a ladder when a very long branch which I'd cut came loose and fell across my back, pinning me to the ladder. The spines pierced my ex Army leather jerkin and scratched my back! Buddleja - it's a love/hate thing with me. I hate its invasiveness, which threatens our natural habitats, and I loathe the coarse, leggy habit of many varieties. BUT, when properly pruned - extremely hard back, each winter or early spring - the July flowers are sublime. The fragrance is heady and the butterfly-attracting qualities are surpassed only by Verbena bonariensis. 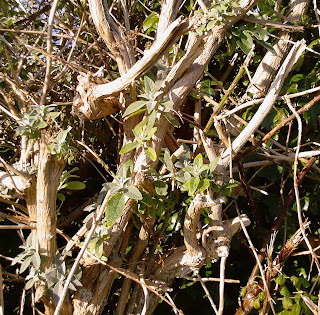 Also, spare a kind thought for the less invasive Buddleja species! B. fallowiana is a gem; B. auriculata has fragrant winter flowers and the pink-red blossoms of B. colvillei don't look a bit like the rest. Oooh, sorry, this comment is far to long. Your pics, as ever beautiful and fascinating. Must go now, and admire my snowdrops before the sea engulfs them! Interesting comments can never be too long! Ever since reading your blog yesterday, I've been wondering whether I could fit a winter jasmine in. Despite my railings against buddleia, I like effervescent, irrepresible plants. Rose thorns - your experience with the Mermaid sounds frightening and painful. Did you manage to free yourself or did you have to be rescued? My next door neighbour, Esther, was up a ladder, pruning (otherwise to be described as hacking back)a Rambling Rector, when a thorn dug deep into the soft part of her hand, below the thumb. She managed to get off the ladder before the pain kicked in. By the time she'd got into her house, she was nearly fainting - and that was the end of pruning for that morning! As for buddleja – Plant Mad Nige using the newer spelling for it – I agree that the one that runs wild can be a nuisance, but also that for butterflies and scent it’s great. As for coastal erosion – I was living in Swanage some years ago when half the cliff slipped, just beyond the Grand Hotel. The result, viewed from afar, looked like a spaceship. I wonder if Esther knows anything about it ? (I’ll look to see whether I’ve got a photo). Have missed South Today recently – have there been any more recently ? It's sad to see how erosion can ruin beautiful areas. I guess it's a natural phenomenon. Thank you for stopping my blog :-) Our buddleias have been poor the last couple of years, thin and spindly with few flowers - and hardly any butterflies to attract. Hope your hand is ok! I had to laugh when I read your comments about being stuck in the bush - and it reminded me of when I got my legs tangled up in brambles at the top of my garden and ended up flat on my back, howling with laughter, covered inscratches and unable to move! Fortunatly Himself was nearby and, once he'd stopped luaghing, was able to haul me out! I've had to dig up some buddleia to make space for my Japanese garden - but I obviously didn't get all the roots out.....I've spotted some new shoots, so I'll have to do battle if it ever stops raining! I don't mean to minimize your situation of having been stuck, bleeding, to a rosebush (verily! ), but you have a very funny way of recounting your adventures! The only buddleia I know are butterfly bush and they do not get THAT unruly here, thankfully. Bare Faced Gardener - Have you been ok throughout the recent storms in France? Esther seemed to know a lot about the massive landslide at Lyme Regis last year. Then, yesterday, BBC Radio 4 (always bang up to date with the news!) reported on an area the size of the UK which was joined to the East coast of England until climate warming during the mesolithic era made the sea rise and cover it. It has been called 'Doggerland' (horrid name, Fisher, German Bite not withstanding)and is currently being excavated. Sunita - I have never been in contact with a Bougainvillaea and it sounds as if I wouldn't enjoy anything other than looking at it. To my ears, though, it sounds a very exotic bush to get stuck to. Jan - Those dead brown flowers - that's part of the trouble . . . none of us are going to go along the hedges and trim them off - and they can end up looking quite disgusting. On the other hand, once they are past brown and have moved on to black, they can make interesting shapes agains a dull, grey, winter's sky.